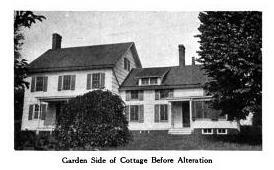 The William E. Hawxhurst homestead before the Peabody, Wilson & Brown designed alterations for John S. Phipps c. 1918 in Old Westbury. Click HERE to see the residence after the alterations. Photo from Architectural Forum, 1919. Nice to see the gates have been restored. Even restored the entrance gates just arouse feelings of saddness, not just for the fate of this estate but for the enormous changes that have transformed this part of Long Island and like yesterdays post on Old Westbury, how much continues to change. great find halfpudding. Is the Knollwood park open to only local residents or is it state owned? It's owned by Nassau County. super restoration job by the village but articles like that only bring out more and more vandals who have continuously pillaged the remaining garden structures since I first hiked the trails.